1. What brought you to Scottish Country Dance Music? John drifted into dance music around 1972 from amateur classical music - making under the influence of friends who already played for English country dancing. Although Judy was a classical violin teacher she was recruited by John's band in 1977. From 1979 to 1986 we lived in Scotland but ironically - with four children to occupy us - we hardly played during those years. Around 1993, through a mutal friend, we became aware that, while we were musicians without dancers, there was nearby a Scottish country dance club with no musicians. The obvious match was made, and has survived nearly a quarter of a century. 2. What do you enjoy most? What we both enjoy most is playing well (we know that we sometimes play badly). Judy particularly enjoys playing typical strathspeys. John derives a lot of pleasure from writing new tunes and arranging new sets. 3. What's your favourite tune? There are so many great tunes that it's difficult to single out a favourite. We find it more meaningful to assess combinations of tunes in sets. Our favourite sets include those we play for "Shiftin' Bobbins", "City of Belfast", "The Dream Catcher", and "The Glens of Antrim". 4. How long have you been playing Scottish Country Dance Music? While there were Scottish tunes in our repertoire in the 1970s, our real contact with Scottish country dancing began c. 1993. John has recently published a book of tunes, which you can buy from him. Follow this link for more information. 1. What brought you to Scottish Country Dancing? I grew up in Scotland and Scottish Country Dancing was part of the PE programme for school from about age 6! It was also part of the Brownie Guide Programme so I danced there as well. I enjoy the mental and physical challenge. 3. What's your favourite dance? I like the dances to well known tunes e.g. "The Irish Rover", "Mairi's Wedding". 4. How long have you been doing Scottish Country Dancing? Since I was 6 means 71 years!! It's how my parents met; and I started in school. The international friendships - I can dance anywhere in the world. It varies. A great partner can make even a nondescript dance great. In 1981 my late first wife, Irene, suggested that we should take up an interest together, as I had just retired from 5 years as Church Treasurer at the URC in Dorking, Surrey. Irene had danced as a child and teenager in St. Andrews and we decided to join an Adult Education Class in Scottish Country Dancing in a local school. Although strictly a Class, it was run very much like a Club, with many people staying for years and a few new people joining each September. When we came to Ireland in September 1987, Irene looked up the phone book to find a Presbyterian Church, rang the Manse and spoke to Rev David Caskie, who said "You will be very welcome, and if you do Scottish Dancing, you will be doubly welcomed with open arms." I enjoy the physical activity of dancing, and not just Scottish Country Dancing. Then there's the pleasure of meeting people and the friendships one makes. I love to know the origins of a dance, and also what the music is, as I find that a most important part of the whole experience. I'm not sure that I can name one favourite dance. I have many that I really enjoy - across the whole spectrum of dances, be that reel, jig, strathspey (traditional or slow air type); old or new; simple or complicated - but they all have a good set of tunes. As indicated in my answer to question 1, I started Scottish Country Dancing in September 1981. "The Wind on Loch Fyne"
My father started dancing shortly before I was born, and when I was 15 he brought me along when his club in Stuttgart organised a beginners' evening. I liked it so much that I stayed! Dancing in time to the music, symmetric patterns, Pas-de-basque setting. Men in kilts. I like medleys a lot, and I love Schiehallion reels (if danced well). Therefore, the dance "Thirteen-Fourteen" is one of my absolute favourites (it is a medley with Schiehallion reels in it), and also "The Elephant's Stampede" (it also contains Schiehallion reels). Since I was 15, i.e. since 2006. I joined the dancing so I could dance at the Hydro in Crièff when I went there for the New Year celebrations. I enjoy the friendship and always going home smiling with a great joie de vivre. I've never been sorry I made the effort to travel to Dun Laoghaire for the dancing. Everyone knows my favourite dance is "The Irish Rover". I'm too ashamed to say how many years I've been dancing - just say nearly one hundred! 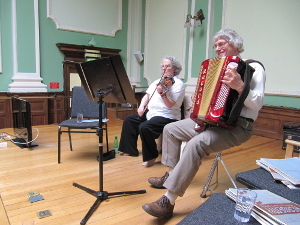 I came to Scottish Danicng from a long interest in folk dance generally, and then an open day a Ceili was advertised to which I went, and stayed. Just everythig - the music, the dance, the friendship. I have many favourites! "The Irish Rover", "Mairi's Wedding", "Catch the Wind", "Shiftin' Bobbins". I have been dancing since about 2010. As a member of the Benevolent Society of St Andrew, Alan Corsini showed me a Strathspey step (after a Ceilidh dance in the National Yacht Club in 2014) and I was 'hooked'. Dancing, mental co-ordination and moving myself. All exercise is great. 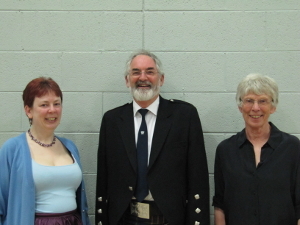 Meeting the lovely caring people who make up the Scottish Country Dance Club. Not long enough; but so far from January 2015. I also adore Scotland as both my husband's and my own ancestors originated in Scotland. I try to visit there as often as I can. My first visit was 1969 and the rest is history. Meeting great people, sharing a passion and realizing at St. Andrews Summer School that these dances are not danced just in Scotland, but all over the world !!! Dances I could name as my favourites would be rather about Ceilidh, because I started with Ceilidh, but I prefer fast dances like reels, although strathspeys are majestic... I could name "De'il Amang The Tailors" as I had the chance to dance it in front of Glamis Castle and for my own wedding too. It was by accident. I was picking up my sister from a dance class that just started at the University of CA, San Diego. I got roped into a dance and I was hooked ever since. The warm welcome and the friends that I made all over the world. I met my husband when I danced with the Tokyo group. I also love going to the dances and dancing to live music. I have lots of favourites depending where I'm dancing. "Red House", "The Irish Rover", "Mairi's Wedding", "Australian Ladies", "Garry Strathspey" to name a few. Since I was at University so about 28 years now and still going. There wasn't any Irish dancing in Tokyo as of June 1991. A friend in Sydney had pressed the Tokyo Branch contact details on me, so I started doing Scottish to get my dancing fix. The Irish dancing started in August 1991, but I already couldn't stop doing Scottish, so I've been doing both ever since. Dancing. Dancing with my partner and with the rest of the set. I also appreciate having good friends from all around the world that I've met through dancing, and that you'll be made welcome at any Scottish Country Dancing class anywhere in the world even if you're just dropping in for one night. The next eight bars, whatever that is. Since 1991, in each of the four countries where I've lived since then.